The Rockford IceHogs put in a decent effort in Texas this past weekend, earning a split against the Stars. With each contest being of the must-win variety, two points in Cedar Park just isn’t enough to get the piglets over the playoff hump. Rockford is currently on the bottom of a five-team sprint for the last two playoff spots in the Central Division. With three games left to play in the regular season, the Hogs figure to wind up on the outside looking in. On the strength of an eight-game winning streak, Milwaukee (83 points) has leapfrogged Iowa for third place in the Central Division. The Wild, who have dropped eight in a row, now sit in a tie with Manitoba with 81 points. Texas trails Iowa and the Moose by a single point. In seventh place, with 78 points, are the IceHogs. 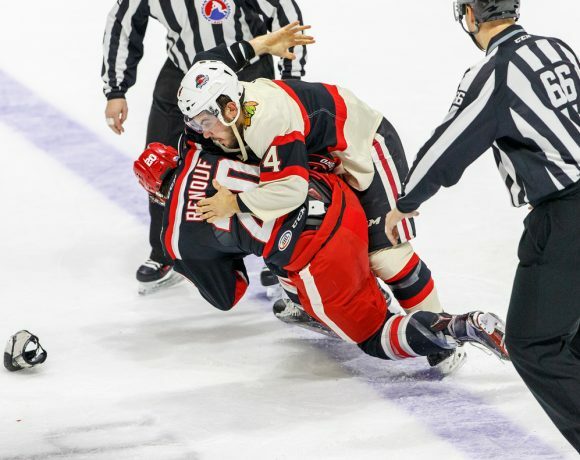 Rockford winds up its schedule with the Admirals in Milwauke Tuesday and at Iowa Saturday before wrapping up the regular season at the BMO against the Ads Sunday afternoon. Even if Rockford were to sweep this week, it seems unlikely that they can earn enough points to vault into fourth place. Peter Holland led the Hogs in Texas with four points (2 G, 2 A) in the back-to back. He had the only goal for Rockford in a 2-1 loss to the Stars Friday night and got another in the Hogs 4-3 shootout victory Saturday. Holland’s goal Friday tied that game in the third period; Texas would pull out the win on a penalty shot by Ty Dellandrea midway through the final frame. Saturday was a back and forth affair, with the IceHogs tying the contest on a Tyler Sikura goal with just over five minutes remaining. 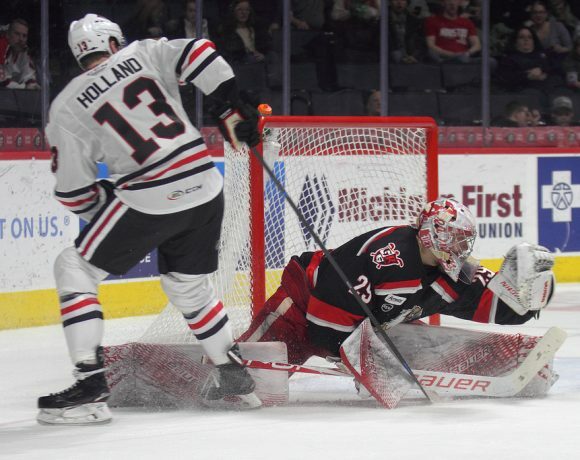 Holland, who had scored in the second period of regulation, kept Rockford alive in the third round of the shootout, which ended with a successful attempt by Jacob Nilsson in the fifth round. The goal tending was solid throughout the weekend. Collin Delia stopped 26 of 28 Texas shots in a losing effort Friday. Anton Forsberg turned away 32 Stars shots, including a pair of point-blank attempts following Rockford turnovers in overtime. Forgive the hyperbole, but Rockford really pulled a rabbit out of its hat back on Tuesday night at the BMO. Trailing San Antonio 3-1 through two periods, a listless IceHogs team came out in fast-strike mode in the final frame to keep hopes alive. William Pelletier scored twice in a thirteen-second span in the seventh minute to tie the contest. Rockford gave the stunned Rampage a reprieve until Dylan Sikura scored his second goal of the night at 15:25 of the third to put the Hogs ahead. On the next shift, Andreas Martinsen knocked in a rebound of Brandon Hagel’s attempt to cap off a 5-3 triumph. As impressive as Tuesday’s rally was, it came at a price. Jordan Schroeder was helped off the ice at the end of the first period and did not return to action. Schroeder did not skate in Texas this weekend. Last Monday, Dylan Sikura was assigned to Rockford by the Blackhawks. The next day, Sikura was joined in the Hogs lineup by Matthew Highmore. Highmore made his return to action following an injury suffered back on October 28. Dennis Gilbert was recalled by Chicago Tuesday, played for the Hawks Wednesday and was returned to Rockford that night. I was happy to see Gilbert get a look from the parent club; I felt like he was a player who made strides in his development this season. Thursday, Rockford re-signed defenseman Dmitri Osipov to a new PTO after releasing him last week. They also inked forward Philipp Kurashev to an ATO after his junior season ended. Kurashev played in both games against the Stars; Osipov skated on Saturday night. Friday, goalie Kevin Lankinen was recalled by Chicago to back up Cam Ward in Nashville in the Blackhawks season finale Saturday. He was assigned back to Rockford Sunday. In 19 games with the IceHogs, Holland has 15 points (7 G, 8 A). That’s not quite at the pace he was scoring with Hartford for most of the season, but he leads Rockford in points since joining the club. For the season, Holland has 64 points (27 G, 37 A), good for a tie for seventh in the AHL. Schroeder had 16 points (8 G, 8 A) in his last 19 games dating back to February 16. Even if he doesn’t play again this season, he has set a career-high in points with 45 (19 G, 26 A). Highmore was back in the lineup for all three games this past week. He had an assist in each of the games against the Stars. From February 1 to March 16, the Admirals were 4-7-7-1 and just about out of the playoff race. Beginning with the three-game set with Rockford, with started March 22, Milwaukee is 8-0. 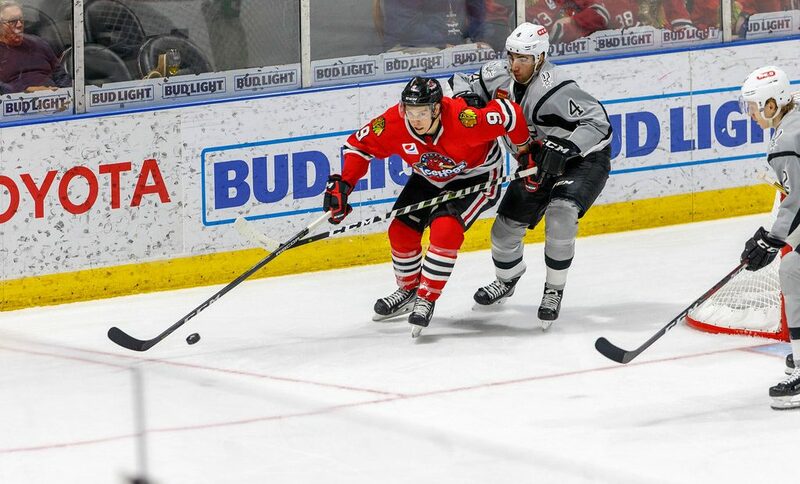 That three-game sweep at the hands of Milwaukee will wind up the difference between The IceHogs making and missing this year’s Calder Cup Playoffs. As of Monday morning, all eight Central Division teams have played 73 games. No games in hand for anyone in the division at the moment. Despite two helpers this weekend, Anthony Louis is going to see a drop in his offensive numbers from his rookie campaign. More concerning is the fact that his scoring has faded badly in the latter part of both his pro seasons. In his last 32 games this season, Louis has two goals and six assists. Rookie defenseman Lucas Carlsson, who paces the Hogs blueliners with eight goals, is on a twenty-game goal drought. In his last 20 games, Alexandre Fortin has one goal and one assist. 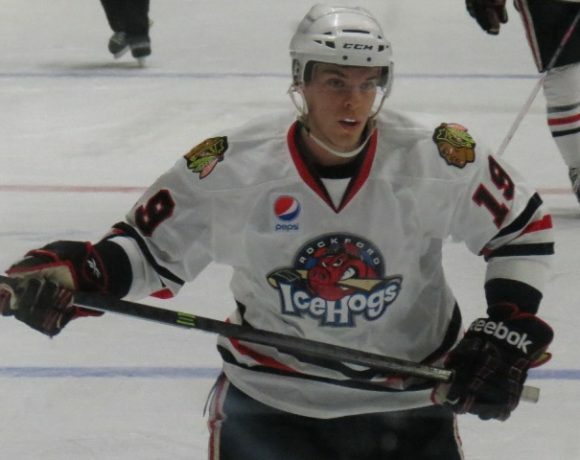 It’s been a disappointing return to Rockford for Terry Broadhurst, who hasn’t skated for the Hogs since March 1. In 40 games played this season, Broadhurst has four goals and eight assists. These are by far the worst scoring numbers in five full AHL seasons. Tyler Sikura’s goal Saturday was his first since December 19. In a season win which he missed two months with a broken thumb, Sikura The Elder has 19 points (7 G, 12 A) in 47 games. With a plus-five skater rating (fourth among active Hogs), Sikura is an RFA I’d like to see back in town next season. Goals or no goals, his work ethic is evident on the ice every night. Follow me on twitter @JonFromi for game updates, news and thoughts on the IceHogs throughout the season and beyond. High On The Hog: Fewer Fights, Fewer Fans?